He hasn't been free from controversy- Tintin In The Congo is hard to find these days for a reason, the least of which is (what I'm guessing) the somewhat 'problematic' portrayal of Africans in the Belgian Congo when the reality of that chapter of colonial history was dark indeed. For sure, if there's an aspect of these books that makes me cringe somewhat, it's his portrayal of Africans. Herge's portrayal of Latinx individuals and cultures tends to be a bit better, though his portrayal of indigenous folks and Asians is somewhat mixed. He's excellent in The Blue Lotus, somewhat less so with his portrayal indigenous people in Tintin In America. Cigars of The Pharaoh/The Blue Lotus: I don't think I ever realized that these two books were so tightly connected. I knew that they were somewhat connected, but The Blue Lotus is pretty much a direct sequel to Cigars of The Pharaoh. The introduction of Rastapopulous (seen again in The Red Sea Sharks) what starts as a trip to Egypt and dabbling in 'curse of the Mummy' type drug smuggling conspiracies leads to an oddly timely sequel set in a China that's on the verge of war with Japan. (Herge manages to be pretty... progressive? direct? about knocking down western stereotypes of China.) By itself, I would say The Blue Lotus might be one of the best Tintin books of the bunch. For sure, Cigars and Lotus represent the best of the sequel pairings of the series. 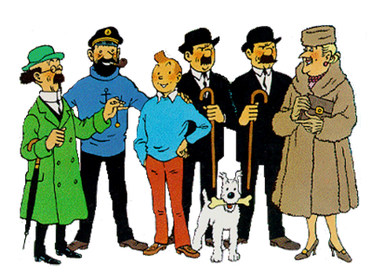 Tintin and The Picaros: The gang returns to San Theodoros to try and free Bianca Castafiore from the clutches of General Tapioca who has imprisoned her on charges of being a spy. Jungles, guerillas, revolutions, carnivals- this one has it all and might be my personal favorite of the series. The Castafiore Emerald: The one where they don't go anywhere, Bianca Castafiore comes to them and loses her emerald in the process. Fun, humorous and full of light comedy this is one of the best in the series to me. Herge proves that he doesn't have to send Tintin all over the globe to carry an great a story. Destination Moon/Explorers on the Moon: Man, I really want to put these two at the top of the pile, because given the fact that they were published first in 1952, seventeen years before we landed on the moon, they hold up really, really well. (Plus, given that SpaceX is working on perfecting reusable rockets that land just like this one does, it seems oddly prescient in many ways.) One of the best Tintin stories, hands down. The Black Island: This one kind of threw me for a loop at first. It starts almost in media res, with Tintin going to help a plane that's made an emergency landing and getting shot for his troubles, but it turns into a satisfying, complex page turner that eventually leads Tintin to a mysterious island off the coast of Scotland where he nabs a gang of international forgers. King Ottokar's Scepter: I always tended to like the character of Captain Haddock and the subsequent adventures involving him, but this one is a solid solo Tintin adventure that plays around with Cold War style intrigue between the Balkan nations of Syldavia and Borduria (the rivalry between the two surfaces again in The Calculus Affair.) I believe this is also the first appearance of Bianca Castafiore. The Secret of the Unicorn/Red Rackham's Treasure: Along with some elements from The Crab With Golden Claws, The Secret of the Unicorn and Red Rackham's Treasure make up the bulk of the first Tintin movie (apparently, more are coming!) But as treasure hunt stories go, this pair are really good. I'm almost tempted to rank them higher, but The Blue Lotus is just so damn good. Also, this is the first appearance of Professor Calculus, so that adds to the fun. Land of Black Gold: some thing is wrong with the world's oil and Cold War tensions and some very familiar geopolitics send Tintin to the Emirate of Khemed to find some answers. Turns out it's a conspiracy involving Dr. Mueller and the enemy of the Emir, Bab El-Ur. Tintin In Tibet: probably one of the ones I've read the most and it still holds up. Tintin and Captain Haddock head to Tibet in search of Chang (from The Blue Lotus). Tintin is convinced that Chang is alive because he saw him in a dream, which makes the motivation for his trip somewhat... odd, but it works out in the end. Also: there's a Yeti. The Seven Crystal Balls/Prisoners of The Sun: A twist on the usual 'curse of the mummy' tale, these two focus on an Incan mummy that is brought back to Europe by the archaeologists that discovered it and they're cursed in the process. Tintin and Captain Haddock head to Peru to find Professor Calculus when he's caught up in the affair thanks to inadvertently putting on an Inca bracelet. Solid stuff all around. Flight 714: Herge dabbles in science fiction a bit with this one and it's got rather mixed results. I don't particularly like it and I don't particularly hate it and I'm pretty sure it implies that Rastapopulous gets kidnapped by aliens and that's the end of that, but it's a solid middle of the pack offering. The Crab With Golden Claws: the introduction of Captain Haddock is a rather middle range affair, to me. It's decent enough-Tintin busts another drug smuggling ring and meets Captain Haddock along the way- though Haddock's character evolves somewhat from the 'pathetic drunk' seen in this book and is the better for it. The Shooting Star: a meteor lands near the North Pole and the race is on between scientific expeditions to get to it first. Pretty 'meh' overall and somewhat undermined by a controversy over the villain of the book, the financier Mr. Bohlwinkel, who used to be called Mr. Blumberg for all the reasons you might think. The Red Sea Sharks: It's back to the Middle East for Tintin and company, this time they're uncovering a conspiracy of human trafficking/slave trading on the Red Sea, exploiting Africans who are on the Hajj to Mecca. Depictions of Africans remain Herge's weak point and somewhat problematic by today's standards- but there are worse portrayals. Tintin and The Lake of Sharks: An adaptation of an animated movie I've never actually seen, I'm honestly not sure where to put this one in the rankings. As adaptations go, it feels like a faithful one- when placed against the wider canon of the Tintin universe, however, it falls short with a general shrug and a 'meh' reaction upon completing it. The Broken Ear: Decent enough. A South American 'fetish' is stolen from a local museum and Tintin heads out on an adventure in South America to track it down and eventually does so. However, I have to rank this one down near the bottom for a couple of reasons. Herge's portrayals of indigenous folks are... somewhat problematic, though as far as I know the Arumbayas are completely fictional, so it's not like he's messing up the culture of an existing tribe. What earns this one a few demerits to me, however, is Tintin's unfortunate use of blackface as a disguise. It's the only time you ever see him do it and it's... not necessary. Tintin In America: the worst of the bunch.. The plot isn't all that great (Tintin takes down Al Capone in a not particularly engaging way) and it's hurt by the fact that it's a collection of stereotypes of America ranging from 30s gangsters to the Old West to some truly cringeworthy portrayals of Native Americans that would be seen as massively racist in today's world.